Our 2019 Artist Spotlight is getting closer and closer! On April 8th, we will be celebrating all our amazing artists and releases! This year we have three of our artists showcasing selections from their latest projects. We thought we’d catch up with one of our Spotlight performers, Kevin Dean. Trumpeter Kevin Dean is a Professor of Music (Jazz Studies) at the Schulich School of Music,McGill University, in Montreal, Canada. Kevin grew up on the plains of America and dreamed of one day being a cowboy. 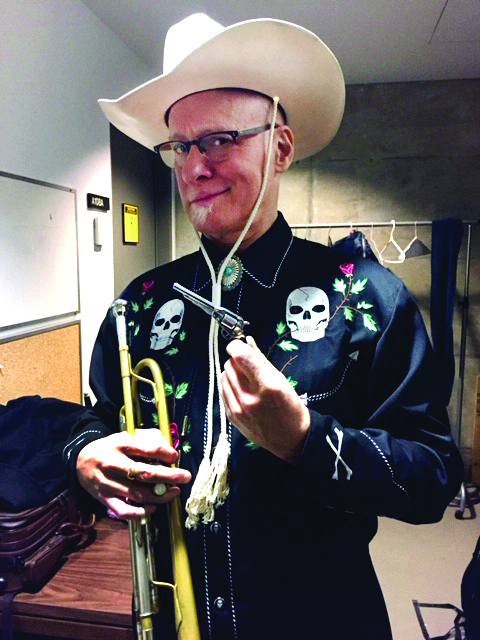 As sometimes happens when people age, they are attracted to the music they heard early in life which lead to his new cowboy jazz album, Sunset Trail. Dean co-founded the Jazz Association of Montreal and serves as their first president. He developed the first Jazz curriculum at McGill and is featured on over thirty CD’s, including twelve with his original music. Kevin has performed in concert and recorded with numerous well-known jazz artists including Jimmy Heath, Benny Golson, Joe Henderson and Barry Harris. 1. Are you excited for the Spotlight, and what are you looking forward too most? I´m very excited and looking forward to connecting with old friends in Edmonton. Paul Johnston, PJ Perry etc! 2. What is your favorite track on your new Album, “Sunset Trail”? I think “Empty Saddles” is a lovely tune by Billy Hill and it came out nicely, Its from the 1936 movie Rhythm on the Range..starring believe it or not. Bing Crosby as a cowboy!! absurd! Google Bing Crosby Empty Saddles and you will see why..
..Also from the same film there the lovely tune by Gertrude Ross, “Roundup Lullaby” which is performed as a duet on the LP with Gabriel Lambert and Marie Fatima Rudolf. The rendition in the film with Bing and Frances Farmer and a huge bull in a barn is completely ridiculous..but the tune is fantastic. I am also fond of “Moon of Mañana” which is virtually unheard of..from the 1939 Gene Autry film, South of the Border. “The Banks of the Sunny San Juan” is also a great old song with a very old fashioned melody with lots of dramatic wide leaps and Jean-Michel Pilc´s whistling is brilliant. All this to say I guess I like all the tunes! I´m not sure I have a real favourite. 3. What is your process when writing and/or performing your music? Well, this is the first album I have done where I don´t play my own music. With the exception of my composition “Cowboy´s Last Waltz,” all the songs are by other people, so I just listened to a lot of music, hundreds of songs really and took notes regarding the ones I liked and how they might be arranged. We actually recorded 15 numbers and I picked what I thought were the best ones to fit the time restrictions of the vinyl. Normally I lead a jazz group..usually a quartet or quintet and I usually compose at the piano or just in my mind and then write it down at the piano or with my horn in hand. 4. Is there any artist or album that you drew inspiration from while working on your new album? I would to say that the most interesting discovery was composer/vocalist Bob Nolan and the group he is mostly associated with, The Sons of the Pioneers. He was a great songwriter and that group was amazing. They sang mostly in 3 part harmony (but sometimes up to 5 part) and they all had quite distinctive voices so the particular blend of those voices is very unique. The also had a very long and successful period from the mid 30´s and into the 60´s with new personnel. They recorded constantly and were on the road, the radio and in movies too. Bob Nolan and Tim Spencer were the main composers and were very prolific. I also like gene Autry´s sort of easy going untrained style of singing. He was hugely influenced by Jimmy Rogers and for the first few years of his career sounded very much like him. That’s a tough one..probably getting ice cream at the town ice cream store: Birdsalls, which still exists. My favorite musical memories would be when my uncle Allan (trumpet) and Gerald (piano/sax) would come home for Christmas or something and have a family jam session. My dad would play bass. Stay tuned for more from our artists! For free tickets to our 2019 Artist Spotlight, Monday, April 8th, Click here.